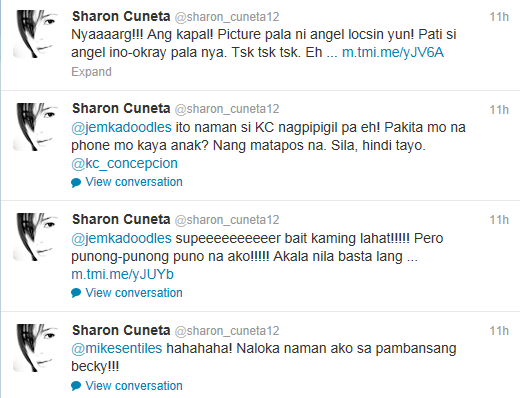 This is becoming a regular occurence on the Twitter account of Cybercrime Law supporter, Sharon Cuneta. So regular, in fact, that I think people have started to make more anonymous accounts just to annoy her and she willingly falls prey. 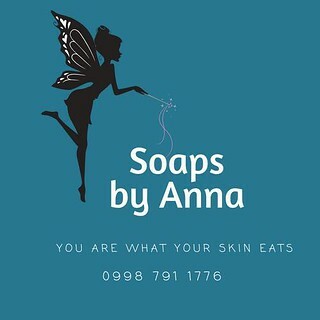 This all started back in March 2012 after the break-up of her daughter with Piolo Pascual. Cuneta started a slew of online rants as reply to sladerous comments regarding her daughter from what she perceived as supporters of her ex-boyfriend. At that time, she was also transitioning to a new channel after over 20 years of being with Abs-Cbn. Despite the record breaking offer that was given her, the transition resulted into an awkward program that reaches but a fraction of her former audience. 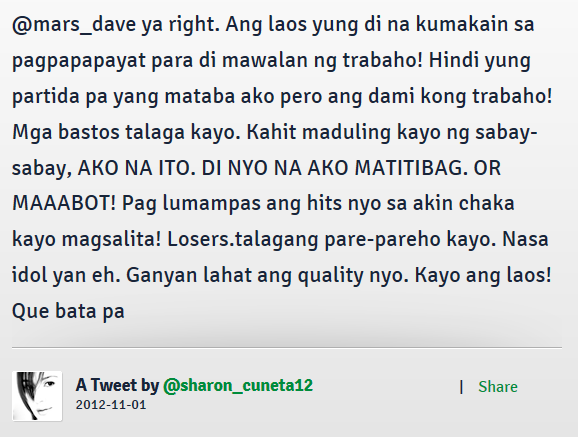 In my initial entry, On Bashers and Haters, I detailed how Ms Cuneta should simply ignore these haters as hundreds of celebrities do so as not to taint the image that was created for her in the 2-3 decades that she has been in showbusiness. After that, I have resolved not to write about her anymore. When she announced support for the oppressive Cybercrime Law for her own selfish needs (that could have been resolved and avoided if she simply did not engage trolls online), I promptly unfollowed her, disappointed at the actor that once served as a role model. But as I saw retweets of her current Twitter breakdown, I am saddened to see how the people around her can allow this to keep happening at the expense of her career. Shouldn't it be in the best interest of her new network to restrict her from posting these kinds of statements? And as someone that advocates the Cybercrime Law, doesn't she realize that her posts could be libelous should the law (fate's forbid) be in effect? It is sad to see the apparent self sabotage that is happening to Sharon where she destroys the very image that was carefully built for her. As for the new "palaban" image that she is trying to sport, there shouldn't be anything wrong with that if she doesn't stoop down to the level of her bashers. Sharon should retire from showbusiness. Keep her mouth shut and disappear in public. She needs to go to the nut house... Shame shame... Those copied above are just about .0001% of her disgraceful rankings in twitter. She has mud all over face now where some stains will stay forever. Boy are we glad here in North America we are not punished with her presence in TV. 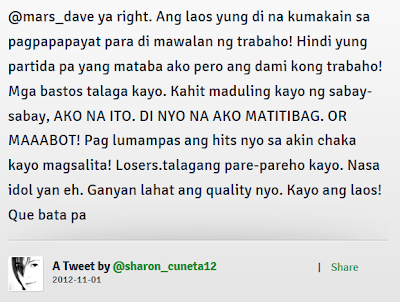 Sharon, if you don't like to retire, pls stayput in TV5. TRUTH is incontovertible...her goody,goody image in the past was just for publicity and far from true....SAAADDD! 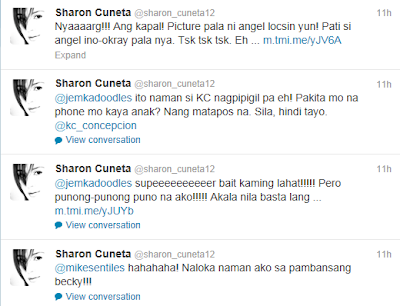 !now we're seeing her true colors...very disappointing!!!!! This is vbeyond disappointing knowing that i thought she has class like when she was still at the pinnacle of her career in ABSCBN. To think she went to best of the best schools.. now, what happened? ?